Mantle Rock Nature Preserve is an area near the Ohio River which contains one of the largest arches East of the Mississippi River. It was also one the tragic stopping sites along the Trail of Tears for the Cherokee in 1838. 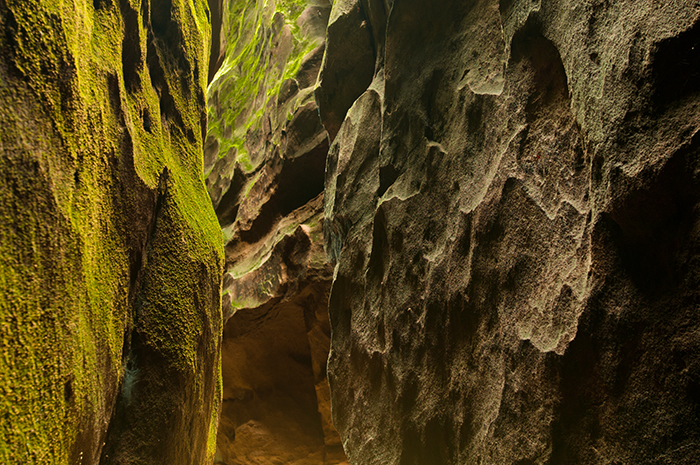 This image is about color, rock lines and light-play converging. Here on the right, the edge of Mantle Rock (which more accurately should be called Mantle Arch) rests closely to another large stone ridge. I kind of think of it as my Kentucky "makeshift-verison" of the slot canyons so frequently photographed out in Arizona. Here the yellows, greens and browns substitute for the reds and oranges found in the desert southwest.